Preheat an oven to 450 degrees F (230 degrees C). Place a piece of aluminum foil over a baking sheet. Place the tomatoes and garlic into a mixing bowl. Drizzle with extra virgin coconut oil, and toss until evenly coated. Season to taste with salt and pepper, then spread evenly onto the prepared baking sheet. 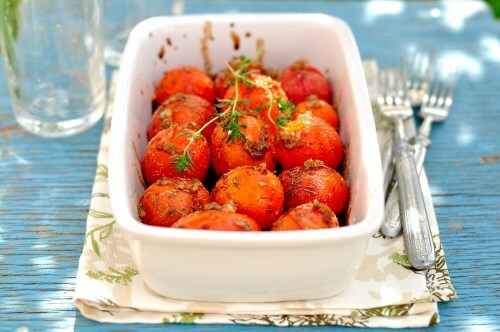 Bake the grape tomatoes in the preheated oven until the skins pop and start to brown, 15 to 20 minutes.